Is your Binghamton, NY home is excessively humid? Is there a musty odor lingering in areas? Then you probably have a mold issue of some kind. If you’re worried that your home might be under attack by mold, Basement Waterproofing, Inc. can help. We have the qualifications it takes to test for mold, evaluate the results, and then help you get rid of your mold problem permanently. Choose BWI for the mold removal you need for your Binghamton, NY home. 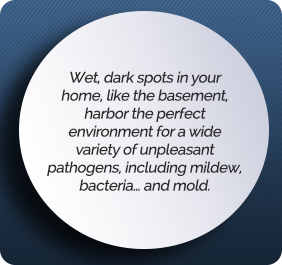 BWI proudly provides mold removal for homeowners throughout the Binghamton, NY area. Nobody should have to live with mold issues in their home. When you need mold removal in your Binghamton, NY home, let BWI talk to you about our SEC anti-mold spray. For your convenience, we’re fully staffed during normal working hours to answer your calls – call us at (800) 439-4951, and we’ll be glad to help.